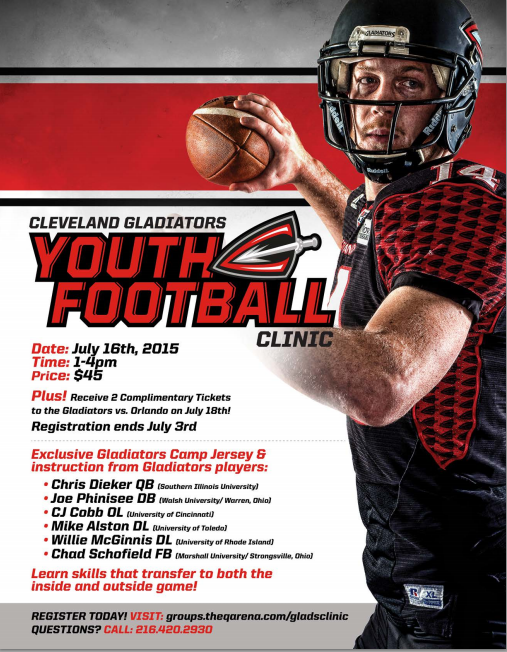 The Cleveland Gladiators Youth Football Clinic was a project I that featured seven Cleveland Gladiator athletes facilitating a sports clinic for ages 5 - 16. There were over 150 youth who participated in the clinic and it was hosted at the Q Arena. Parents were allowed to observe the clinic while kids participated in drills on the field. The camp was three hours long, followed by an autograph session with the Gladiators. During Gladiators Game fans are selected to participate in on-field promotional activities. The Arena Football League is self-titled "The Ultimate Fan Sport" because fans are right up on the action, and are often a part of the entertainment. The Fan Experience is a way for the Cavaliers Operating Co. to not only highlight our fans, but also may fulfill corporate sponsorship promotions. Fan Experiences Packages are offered to large group available for purchase. (Pictured) In-Arena Host/Special Projects Coordinator Ahmaad Crump, two Gladiator Girls, Rudy (Mascot), and Radio Personality J.G.